Posted on 10, May 2016 by EuropaWire PR Editors | This entry was posted in Automotive, Belgium, Technology and tagged Toyota, Toyota Avensis, Toyota Touch 2. Bookmark the permalink. Brussels, Belgium, 10-May-2016 — /EuropaWire/ — The first updates are being made to the current Toyota Avensis range, as it approaches its first full year on sale. The principal change for the 2016 range is the installation of the latest version of Toyota Touch 2, Toyota’s touchscreen-controlled multimedia system. Avensis benefits from latest iteration of the technology, as previewed at this year’s Geneva motor show. The home screen menu has been redesigned and access to the My Toyota online customer portal has been made simpler. The satellite navigation package has been rationalised into a single customer offer – Toyota Touch 2 with Go – with the added benefit of three years’ free map and connectivity updates*. This can be extended by a further two years, if desired. This gives peace of mind that journeys can be planned accurately, with access to apps giving the latest on traffic flow, weather, fuel prices, parking availability and other useful information. The system can be linked to a number of on-line service providers, including Google Search, Google Streetview, Aupeo!, Aha and Twitter. 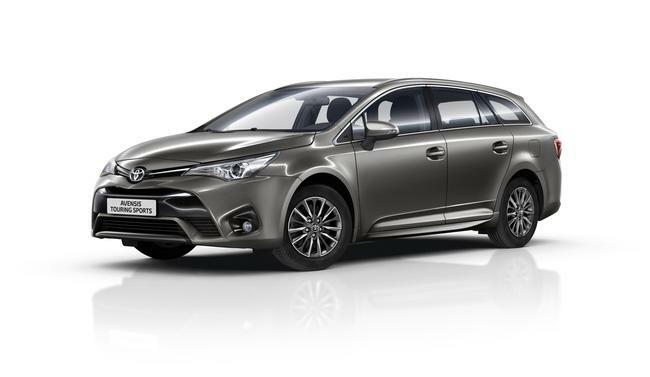 The Avensis sedan and Touring Sports are newly available with an optional Platinum Bronze exterior paint finish. A new 16-inch alloy wheel design has also been introduced to the 2016 line-up, which is on sale now. The new Toyota Avensis, launched in 2015, has firmly established the model’s credentials as a strong and attractive market competitor. Built and designed in Europe and for Europe, it offers prestigious, dynamic styling, rich sensory quality inside and out and, thanks to precision chassis and steering engineering, a rewarding experience behind the wheel. Customers are appreciating the benefits of the improved CO2 performance across the range of powertrains, including the new 1.6 and 2.0-litre Euro 6-compliant diesels, performance that attracts significant tax benefits in several European markets, strengthening the car’s profile as a sound proposition for the fleet and business market. The Avensis has also pioneered Toyota innovation in active safety, with the standard provision of the Toyota Safety Sense systems package on all models.